Hi peeps! Ah, it's Wednesday....the middle of the week, on the way to the weekend! I told you yesterday that I made another "wooden" card using the leftovers from my Tuesday card (you can see it here)....and that it was perfect for the Merry Monday challenge this week! My only other embellishment was some white baker's twine....simple and easy! A few of you asked if I had gotten any responses to my frustration with "fuzzies" or lint on my photopolymer stamps. I did get some good suggestions, but the only one that I hadn't tried yet was a product from Lawn Fawn called a Stamp Shammy. You can look it up on their website...seems like a good product and my Paper Players teamie Laurie said she loves it! So I'll keep you posted! Another rainy day....and Cassidy has been BUGGING me to let her use an umbrella on the way to the bus stop. I had an old one, and we practiced putting it up and taking it down (I can see big problems on the bus with these complicated maneuvers!) and when I was satisfied she knew how to do both, off she went with Grampy to the bus. We'll see if she leaves it at school, or on the bus, or somewhere in between!!! Hello LeAnne: I love, love your beautiful card, the way you made those wood planks is amazing and the little Christmas tree is simply adorable with it's little ornaments, looks like it's cut out of felt. Beautiful die cut sentiment too. Awesome card LeAnne! Love the wood plank background!! :) Such a cute photo! OH what a perfect Christmas card! I do hope you have a friend who lives/vacations in a log cabin, LeAnne! So cute! I like this one even better than the first one, LeAnne! I've GOT to try this technique! And awesome card! Thanks for sharing with us at Merry Monday! Hope that umbrella found it's way home in one piece. Sooo cute! Love that tree with the woodgrain BG. Can't believe how big Cassidy is getting too!! I love your card! CAS and rustic and cute! Great job! Oooooh I love this card! Your cute little tree looks great on that wood background! Very cute, CAS card!! Thank you for joining us at Merry Monday! I love your barn boards! Fantastic idea. 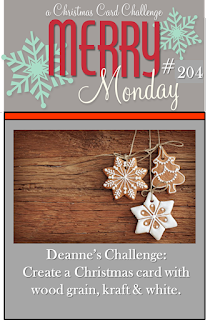 Thanks for joining our challenge at Merry Monday! Wow I love this! CAS perfection! And I can't believe Cassidy is old enough to ride the school bus!